I've always enjoyed the visual perspective that Infographics give to statistics. 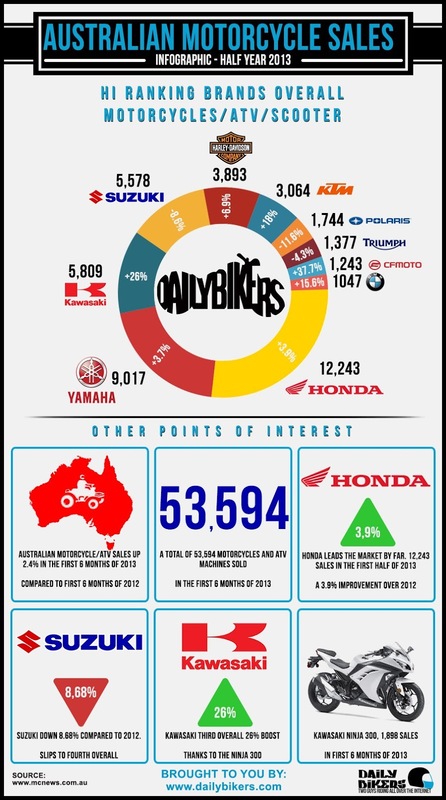 I thought about that in the sense of motorcycle statistics recently so I decided to hire a graphic designer to create one for me to see how it turned out. 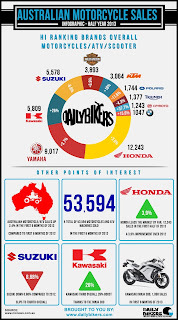 This data was sourced from MCN.com.au and given to a freelance designer on Fiverr, who came up with this interpretation for a really cheap rate. The data is a bit old now and represents the first half years sales in 2013 of most major brands by most sold, but I think it's piqued my interest enough to warrant looking into some more of this kind of thing. Interesting to see just how dominant Honda was last year. I wonder how the rest of the year turned out? Harley made it into the top ten, and Ducati did not.